We’re in enemy territory. That’s what I kept telling me daughter. J and I grew up near Chicago. We’re both White Sox fans. My whole family is White Sox fans. Her whole family is White Sox fans. Even after almost 10 years, it’s still weird living in a market that doesn’t support Chicago sports teams. J and I took our first trip to Comerica Park not long after we moved to Lansing in 2008. 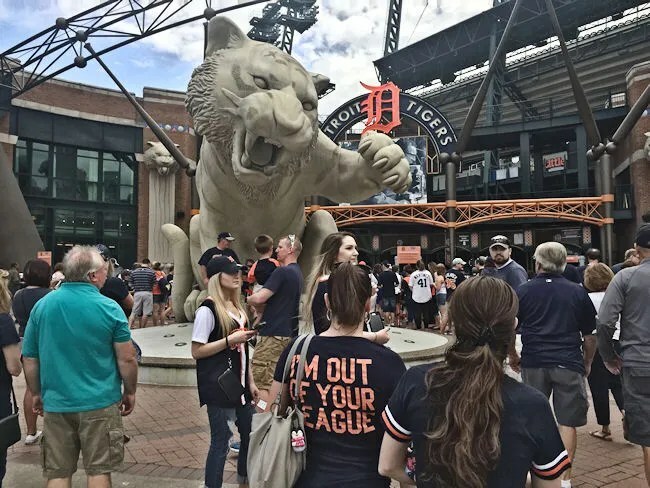 We don’t root (and never will) for the Tigers, but we really liked the game day atmosphere at Comerica and went back a few times when we still lived in Mid-Michigan. One of those trips, we even took my parents as well as my brother and his family. His oldest daughter was maybe 18 months old at the time….so, it’s been a while. 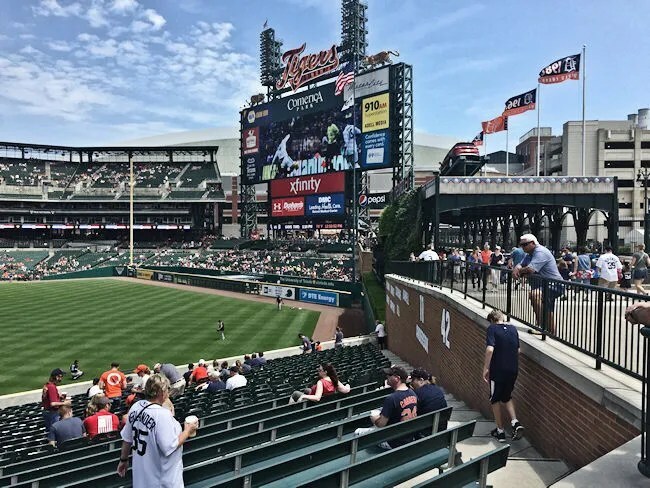 The last couple of years, the White Sox and Tigers haven’t played many games in Detroit on weekends. When the schedule came out this year, my dad noticed several weekend games between the two teams. He asked if I’d be interested in going to game….and there’s no way I can say no to that. 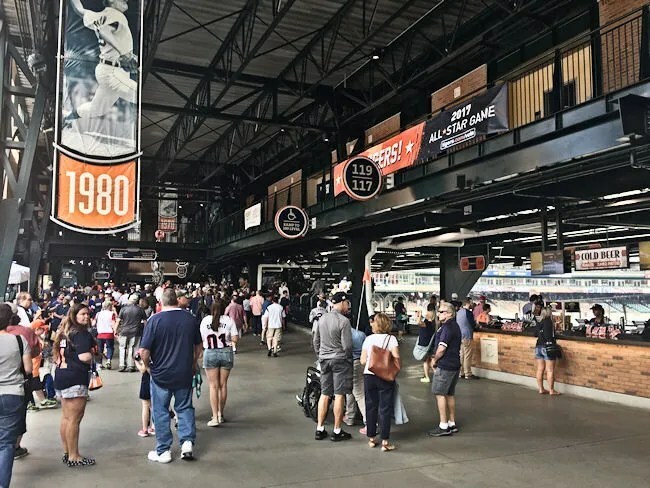 Comerica Park sits right in downtown Detroit in an area that has really built up as an entertainment destination. The park’s address is Woodward Avenue, but it really sits on Witherall Street between Montcalm and Adams. It’s right across Brush Street from Ford Field and just a parking lot away from the Fox Theatre. It’s surrounded by parking lots and ramps, but those lots actually fit in pretty well with the surrounding area. 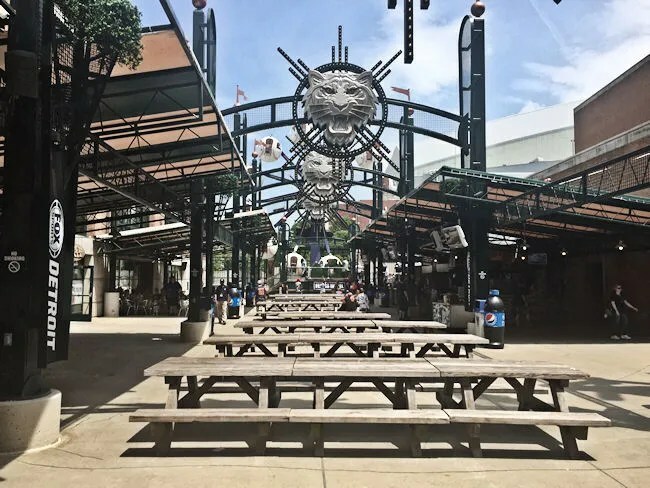 There are still restaurants and bars within a walkable distance and it doesn’t feel you’re parking a mile away in one of the official parking lots. For the first time, I actually used one of the official parking lots and paid in advance when I bought my tickets. We were in a lot next to Ford Field off Montcalm which was surprisingly easy to get in and out of. We left the game a little early so there was no traffic and we were back on the highway in less than five minutes. In the past, we’ve always parked in Greektown and walked. It’s much cheaper to do that, but with two little ones, I decided to pay the extra money and park a little closer. We were on what is essentially the backside of the ball park and I wanted to walk around front to take pictures. 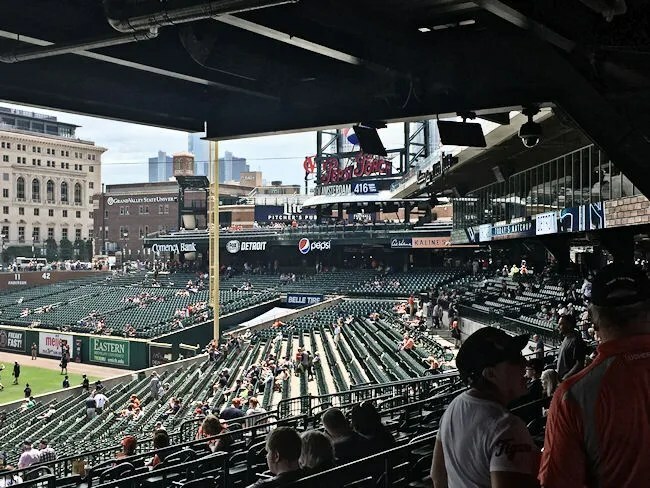 Typically, we would enter the ballpark at the corner of Adams and Brush which brings you in to the park in the left field corner. That would be the closest entrance to where we parked, but if you go all the way up to the “Woodward” side, there’s a grand entrance with a giant Tiger statue. 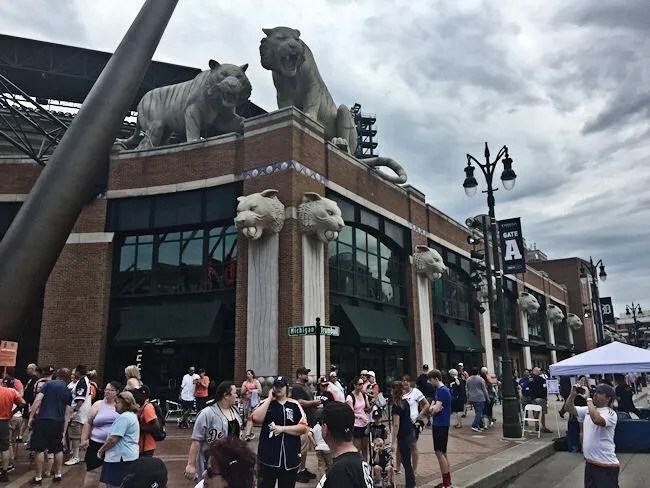 Witherall Street is shut down during games, so this is a great place to take pictures and I wanted some with the family of us in our Sox gear standing in front of the Tiger out front. This area is also where the ticket office is located as well as the team apparel shop. On non-game days, you can park on Witherall Street for a short period of time to conduct business at either. The whole building in this area is adorned with concrete Tigers both on top of the building and with faces hanging off the sides. 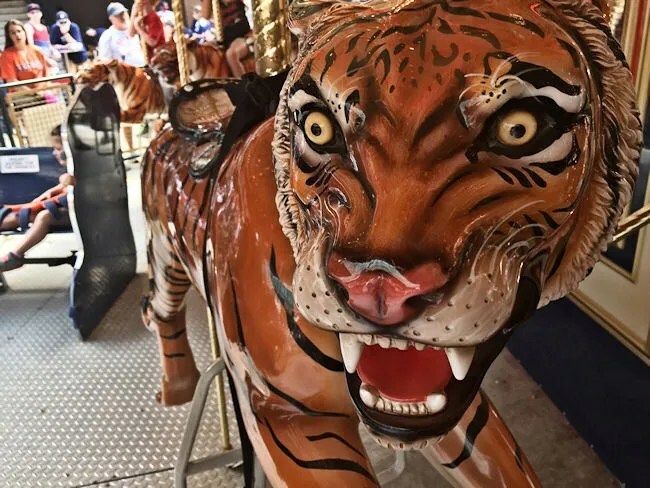 The main entrance to the park is right behind the giant Tiger statue. The MAGS are front and they are divided into three lines. There’s one for season ticket holders, one for people with no bags, and one for everyone else. We had B, so J had her diaper bag and my parents had a bag with water so all of us got into the regular line which only took a few minutes to get through. 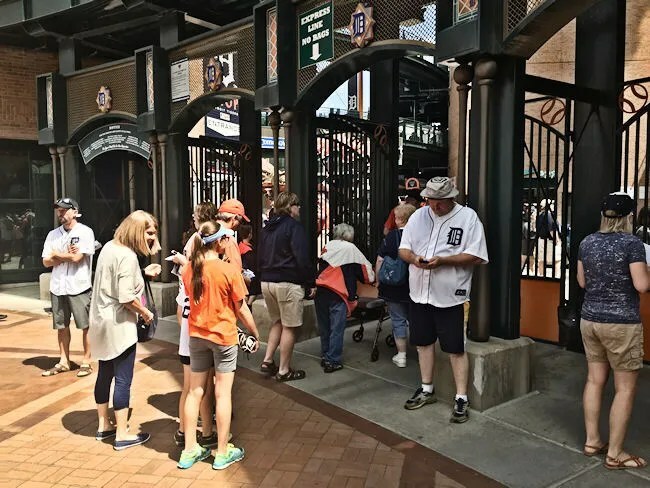 Right behind the security check point is the large wrought iron gates leading in to the ballpark along the right field line. Sunday also happens to be Kids’ Day at the ballpark and we intended to take advantage of that as well. Right inside the gate, we found face painting and the Big Cat Court. Mom went and got in line for face painting thinking it would take forever while L and I headed in to Big Cat Court to find the carousel. 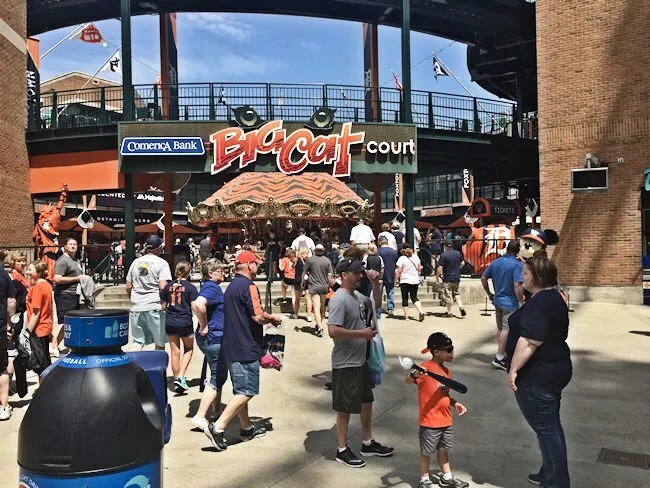 Big Cat Court is kind of like a food court at the mall. There are a number of different food options that line the outside of the place. The carousel is in the middle with a number of tables if you want to hang out and eat before heading to your seats. The face painting line moved pretty quick so J actually got to the front then got out of line because we weren’t there yet. L and I headed over and got in line ourselves so she could get her face painting. She picked a pink Tiger face. This was also free for kids, but they were accepting tips. They did a great job and did it quickly, so they got a pretty good tip. When we got done with face painting, we headed back in to Big Cat Court to get some cotton candy. A large bag that was shared by all of us was a $5 and I was able to use a credit card at the stand. My mom then noticed a Little Ceasars stand and asked if we wanted pizza for lunch. 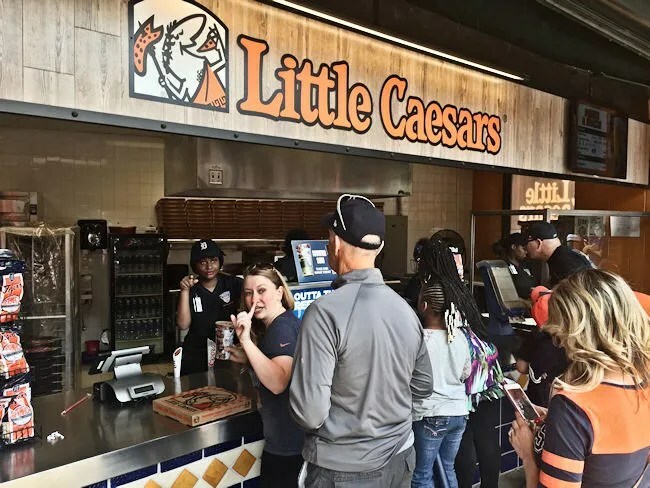 My parents aren’t familiar with the ties between the team and Little Ceasars so they just thought it was cool you could get a whole pizza at the ballgame. We ended up ordering a pepperoni pizza and a souvenir fountain Pepsi. The pizza at the ballpark is not $5…it was $15 and the drink was close to $10, but my mom wanted the cup and she was buying. I got our seats in the bleachers because I figured there probably wouldn’t be much game watching. We grabbed our pizza then headed to the right field bleachers. I also got our seats in the very top row because I know B was going to want to walk around. There were six seats in that row and six of us, so we wouldn’t have to bother people to get up and down. The first thing we did was start handing out pizza slices. Pizza is one thing both J and B will eat without arguing with us. 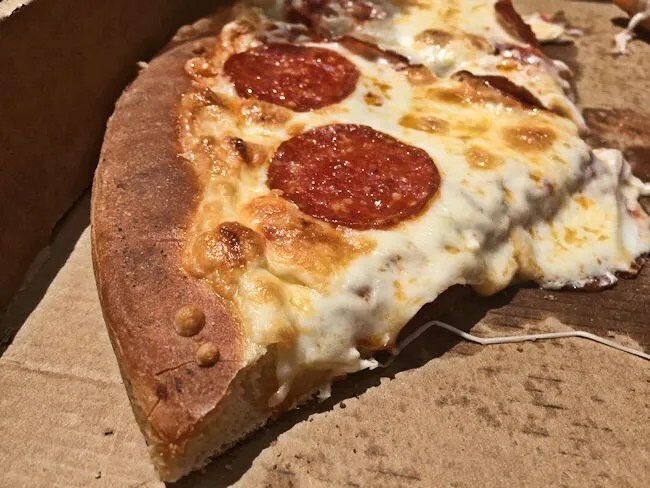 The pizza at the ballpark is the same thing you get at any other Little Ceasars. We went through a whole pizza pretty quickly. By the time my dad caught up with us, there was only one slice left. We should have gotten more, but it was a pretty hot day and food just made things hotter. 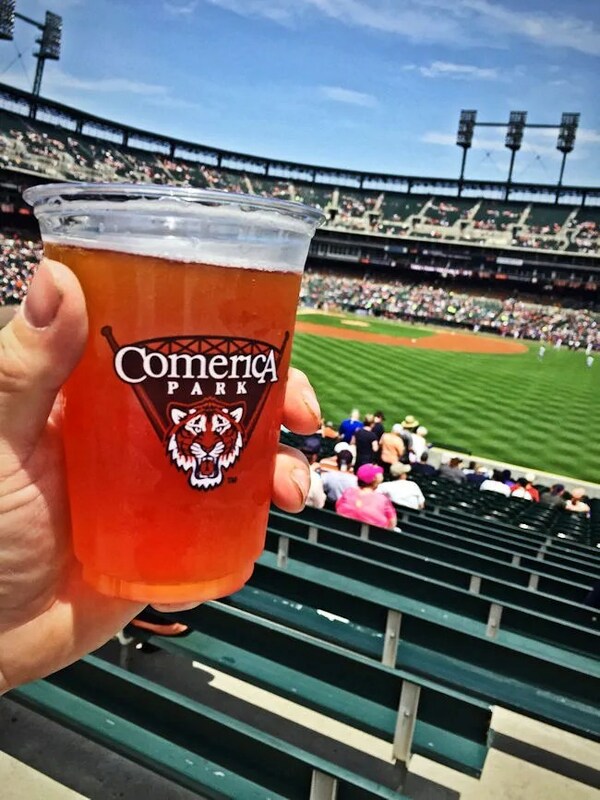 As most parks are doing now, Comerica Park has jumped on the craft beer train. 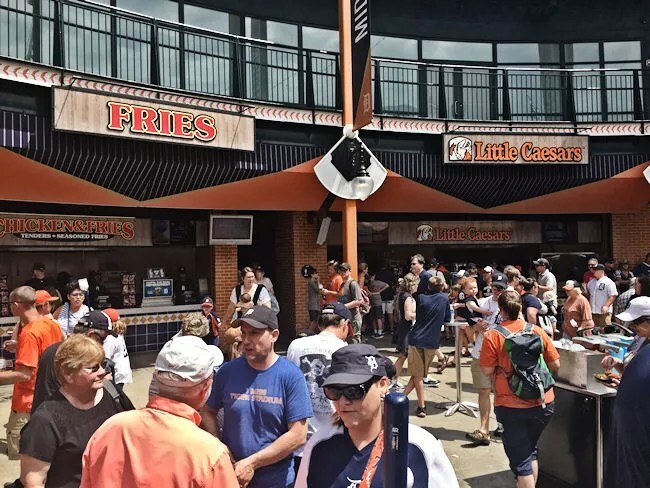 I found a lot of stands throughout the park selling beer and peanuts…. 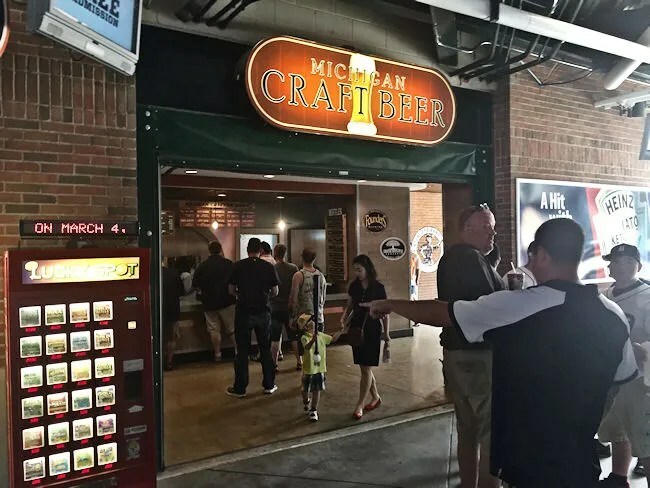 …but there are a couple of specialty areas selling Michigan Craft Beer. One of those just happened to be in right field behind our seats, so after I got all the kids set up with pizza, I snuck off to get myself something to drink. They had a number of options from a number of Michigan breweries, but I stuck with what I know and love. A Two-Hearted Ale from Bells Brewery. The glass is a 16 oz pour and I believe it cost me a little over $10. That’s a pretty typical price for craft beer at the ballpark and I only had one knowing a.) it’s expensive and b.) it was pretty dang hot. The game started at 1:10 which is right around nap time for B. He only took about a 15 minute nap in the car so we knew he was going to need one. J brought in her Lille Baby carrier, so I offered to put B in it and walk him around to see if he’d fall asleep. It worked in Milwaukee, so I assumed it would work again. Plus, it’d give me an excuse to check out more of the park since it has been so long since we had been there. It took all of about five minutes for B to put his head down and go to sleep. I started at our seats in right field and before I got to the scoreboard, he was out. We walked underneath the Liquid Fireworks in center field and I think the shade from that was enough to get him to put his head down. Just past the Liquid Fireworks and underneath the scoreboard are six statues celebrating six of the Tigers all time greats. 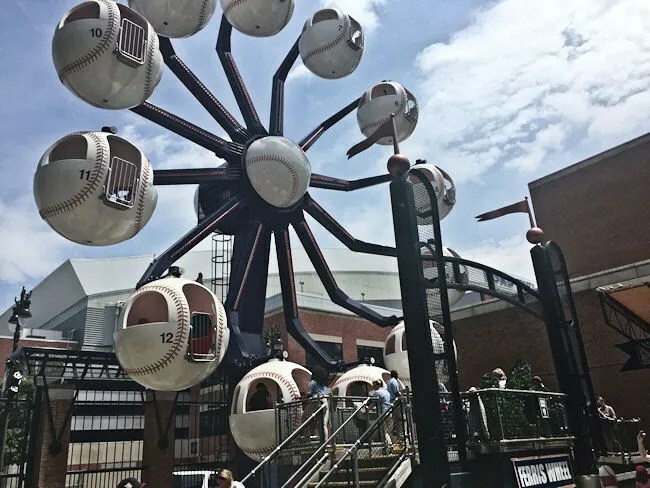 This is another popular feature at ballparks and one I always think is cool to look at. 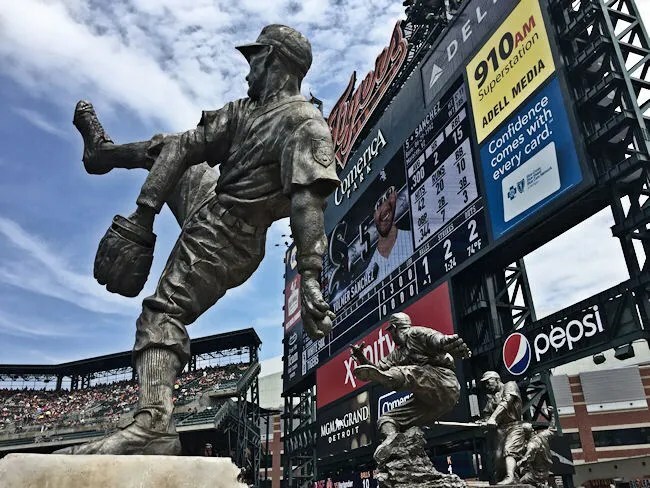 The Comerica statues include Ty Cobb, Charlie Gehringer, Hank Greenburg, Willie Horton, Al Kaline, and Hal Newhouser. 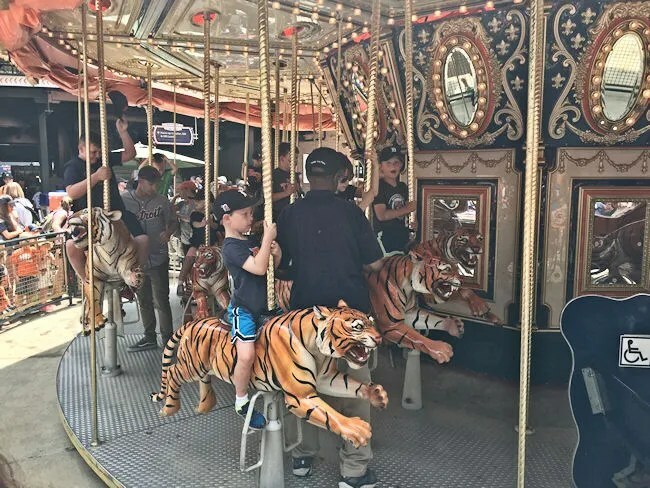 The stainless steel sculptures all depict these Tiger greats “in action.” And really, it’s just another cool feature of the ballpark. Another one of the cool features takes a little more effort. 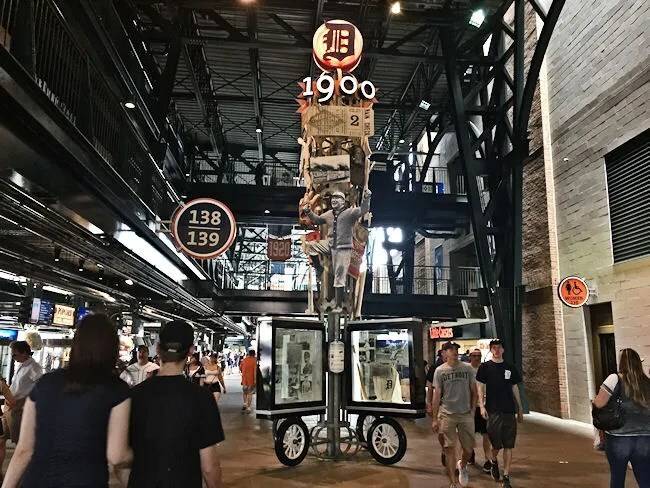 All around the concourse there are poles with Tigers history on them. The “Walk of Fame” is scattered throughout the main concourse. 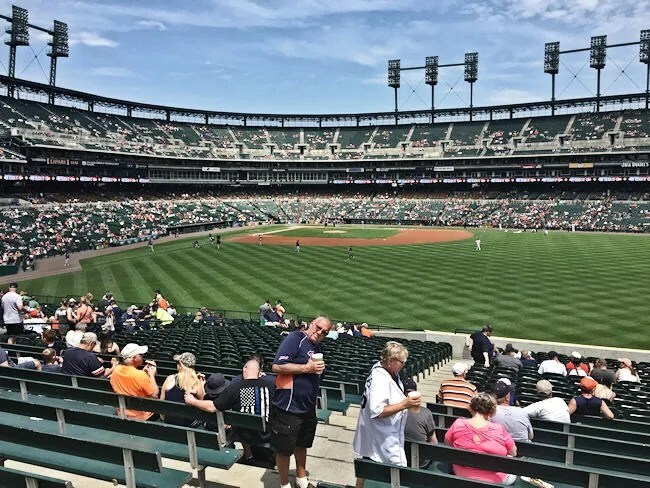 It tells the story of Detroit baseball dating back to the 1800’s. I always stop at a couple of them, but it would take up quite a bit of the game in order to enjoy them all. Here’s the other thing about the concourse, it’s really wide. The game we were at this time wasn’t a sell out, but I was in the park in 2012 during the World Series for work. The large concourse easily handled the overflow crowd for those games. 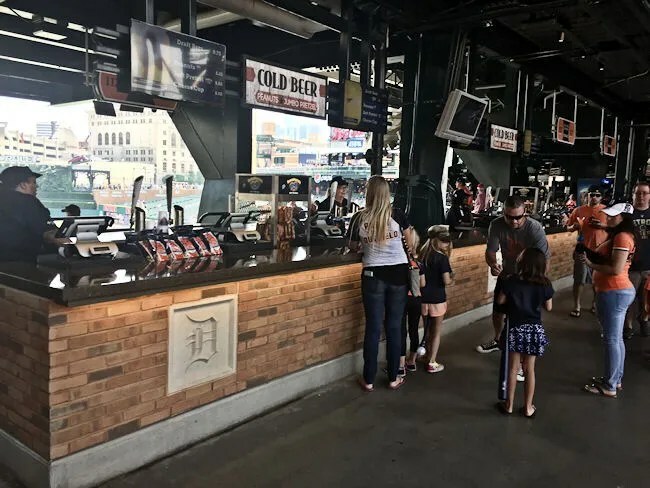 I never went to Tiger Stadium, but I’ve been to other old stadiums and concourse size is always an issue. Comerica Park’s is huge. My son was still asleep so I walked up behind home plate to stand and watch a couple of innings while he napped. It never bothers me to stand at sporting events and B was getting a pretty good nap in. I didn’t realize it, but I was also standing right near Guest Services. 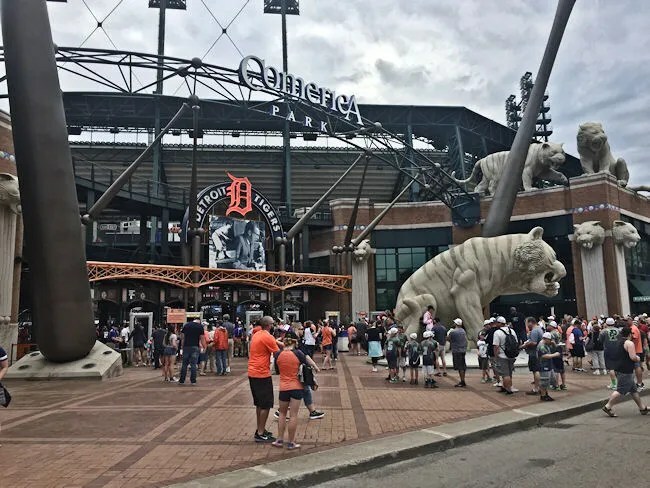 J and I had been texting about getting the kids their “First Tigers Game” certificates. When I turned around to go look for it, the lady filling out the certificates was right behind me. I got in line to get B’s, but I told J to come with L to get hers. I did this intentionally because this area is also where the Brushfire Grill. This open air picnic area is home to a giant BBQ stand as well as a really cool fountain featuring a giant concrete baseball. 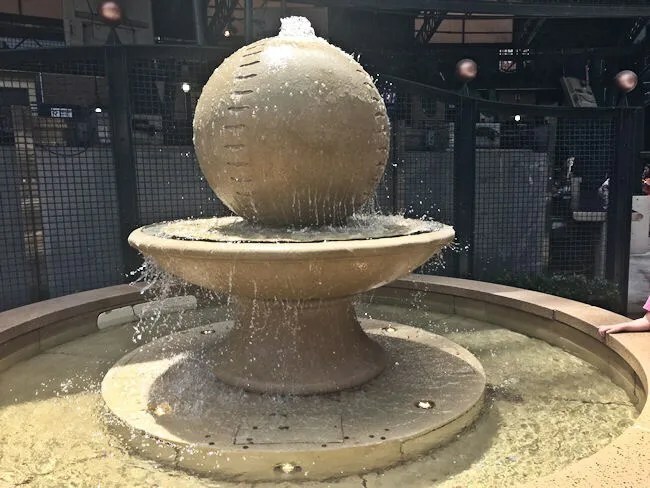 J and I have a picture of the two of us at our first Tigers game in front of this fountain nine years ago. I had J bring L over because at the end of the picnic area is the Fly Ball Ferris Wheel. This is another of the attractions that was free for kids and one L was really looking forward to. J offered to take L on this one because was B was still sleeping. She had to pay the $2 for herself then they got in line while B and I headed back to our seats in right field. At this point, we kind of settled in for a ballgame. 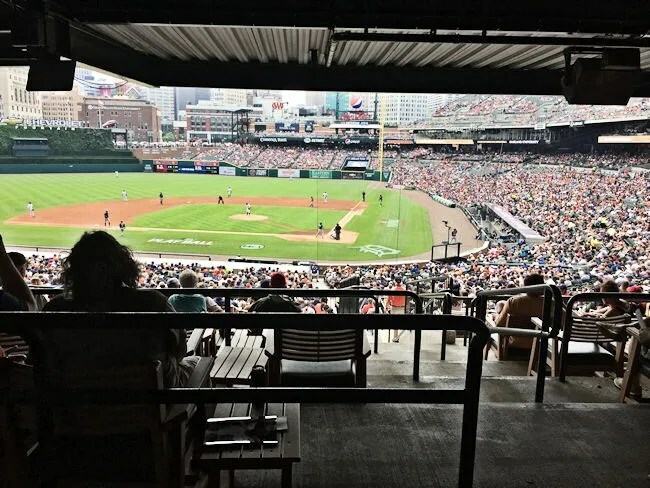 We had seen and done a lot in the hour leading up to the game and the first couple of innings and while I knew the kids weren’t really going to sit and watch the game, I wanted to catch as much as I could. Even sitting in the baking sun strapped to me, B slept for a little over an hour before waking up and leading Grandma on an excursion to the stairs behind us to play on. I know I shouldn’t like it as much as I do, but I love watching baseball in Comerica Park. 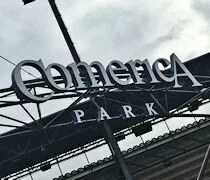 I will never be a Tigers fan and the White Sox don’t even have to be playing there for me to want to go. It’s just such a great park. It’s so well designed. It’s incredibly fan friendly. It’s in a downtown area but still easily accessible. Other than being home to the Detroit Tigers, I don’t have anything bad to say about this great park. Want more exposure for your event, product, or business?! Add swmichdining@charter.net to your e-mail list and I'll post your food related press release on SW Michigan Dining!